The Andersen Chronicle: Milk, Wheat, & Nuts! A couple weeks before Christmas we finally made it into the lab to get blood work done for Mona. We found out that she's allergic to milk, wheat, cashews, almonds, and hazelnuts. The allergy scale is 1-6, and she is a 4 for milk and wheat. She's at a 2 for nuts. We're working toward eliminating these foods from Jen's diet. It's proving difficult, but it's worth a try! Mona loves food. She would love to be eating more table food, as Eliza was at this age, but Mommy is being cautious. She is allowed one table food: Rice Krispies. Here she is, enjoying them. Ramona has always been very active, a go-getter! She is eight months old and quite comfortable with crawling. The past couple of weeks she has been really exploring instead of just going around eating everything she could find. She loves "Sojiki," our iRobot vacuum. We hear Eliza yelling "uh oh" and then Mona squealing as the vacuum backs out of the charging dock. Mona is also very interested in the kitchen and the cupboard in particular. She's pulling chips and hot chocolate out, already! Mona is also very interested in standing. She's always pulling herself up to the couch, to the toy baskets, and to our chairs at the dining room table. If she's not eating her Rice Krispies when we're at the table, she's down under Eliza, tickling feet. We are really enjoying all Mona has to say! The past couple of weeks she has been so eager to say "Hiiiiiiii!" and wave to everyone! She used to only say it to Daddy ("Hi da, I love you"). A few days ago Eliza said "Hi, Mona!" and Mona said, "Hi da da!" She also loves to say "I do," "ssss...ttt... (strawberry)," "guh, guh (good girl)," and "ba, ba." We heard "ma, ma" repeated the other day when she was calling to us from her crib. We can't believe how grown up she is!!! So fun to see new pictures of your little family! I love DC and it is fun to see all of the pictures from Christmas time...thanks for sharing! Jen! Your pages are SO adorable!!! Thank you for digital scrapbooking email, it really helped and is a wonderful resource. Maybe someday my pages will be half as amazing as yours are! You are definitely inspiring to me, Jen. And your girls are just so beautiful. Thanks for sharing all your pages - I am in awe! Jen I found your blog through Megan's and I'm so glad. 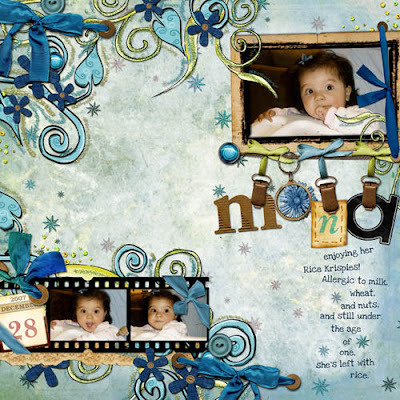 I love to see your digi scrapbooking pages. You are as others have said very inspiring. I've done a few pages and am excited to continue to learn and hopefully be as good as you one day. good luck with the allergies! yuck!